My family is on a fast track to get out of debt. You can read our whole story here. Accountability. We want our friends and family to know our situation and goals. There is a reason we haven’t changed the ugly light fixtures in our home and why we might not be able to grab lunch with you. It’s not in the budget right now. We have to live way below our means until we can get out of debt. Give Encouragement. We want you to see that paying off debt is possible. We are two teachers with five kids—you can do it too. This blog will have posts about our debt-free journey that gives you tips on how we’re doing this in a hurry. I’m always happy to answer any questions you might have and give our best advice. Receive Encouragement. Every time I see that balance go down on our student loans you can bet I’m doing the Cabbage Patch in my living room out of sheer excitement. But you guys, this is exhausting and super-not-fun. There are so many times I want to give up. We want to hear encouragement from you. Maybe you’re in the same boat or have successfully gotten out of debt before. Please share with us. You can leave comments. You go, girl!!! Thank you for being another person in this world who makes it evident that we don’t have to live a life with debt. Woot! Woot! Over the halfway mark! Way to go Bonds! Just found your blog. 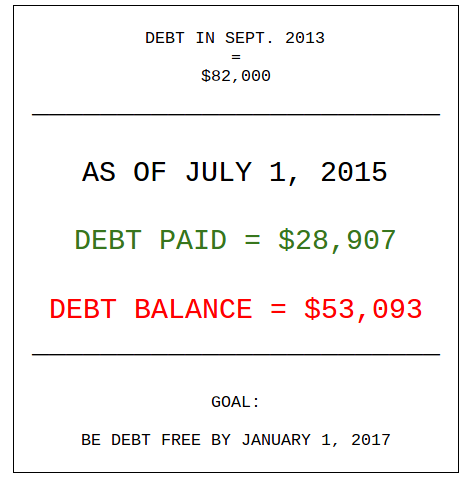 Similar dollar wmount of debt, but we are at the beginning of our journey in paying it off. Thank you for putting it all out there – I don’t feel so frustrated and hopeless now!